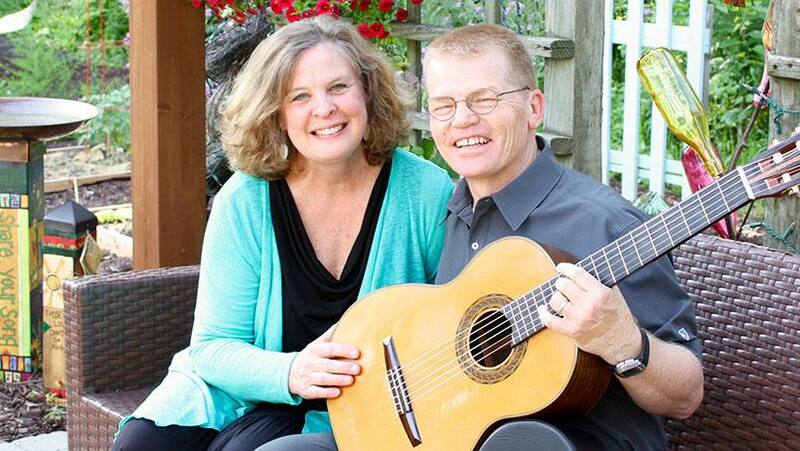 Music has been a part of Sue and Mike Blair's story from the beginning. "We've been singing together a long time," Sue tells us. Longer than she's been a teacher. Longer than Mike has been a pastor. Even longer than the couple — who will celebrate their 36th anniversary in August — have been married. But when Sue was diagnosed with Hodgkin's lymphoma in the fall of 2012, the couple worried that their days of singing together might be over. The cancer was discovered near Sue's throat, and they wondered whether radiation treatment would damage her vocal chords. Fortunately, it did not. And today, nearly four years after her diagnosis, Sue and Mike are still making music together. Now they're sharing that music with others through a new album, Ever Singing. Mike wrote many of the songs during Sue's treatment at Mayo's Rochester campus. He says creating the album was a way to make sense of — and find meaning in — a difficult experience. "Composing was one way to answer the question, 'Where is the gift or blessing in this?'" says Mike, a campus pastor at Luther College in Decorah, Iowa. The couple soon discovered there would be many. Mike says that “everything that disoriented us was then followed by a turn of kindness.” As she adjusted to her diagnosis and began treatment, Sue's first-grade students rallied around her with cards and artwork. Friends and family kept her in their prayers and knew just when to drop by with a meal. And Sue says her Mayo care team, including Ivana Micallef, M.D., Scott Stafford, M.D., and Jessica Towns, "embraced me and Mike and said, 'We're going to bring you through this. We will be with you all the way.'" Another blessing, of course, was music. At one point during her treatment, Sue told Mike, "I feel like you're singing me well." There were other music-related comforts, including the impromptu concerts put on by Mayo staff and patients in the atrium of the Gonda Building. After they received the good news that Sue's cancer was in remission, the Blairs stopped by the atrium to sing a few songs themselves as a way to celebrate and give thanks. "Music has a life of its own and can be so many things," says Mike. "Encouragement, joy, lament, and gratitude." And it's with gratitude for the support they received, and for the blessing of good health, that Mike and Sue are now sharing their music with others. They've sung at the bedsides of friends and family members facing cancer, including a family member who recently passed away. They've performed at a few public events and hope to schedule more. "We feel this is a calling and a way for us to encourage others," says Mike, who has twice faced his own cancer diagnoses (melanoma), both times treated at Mayo Clinic. "We hope these songs help others who are in that middle ground of experiencing a diagnosis. We hope it will help show them a way to persevere." To listen to the music inspired by Sue's diagnosis and recovery, visit the Ever Singing website. Then inspire us by posting your comment below and by sharing this story with others.